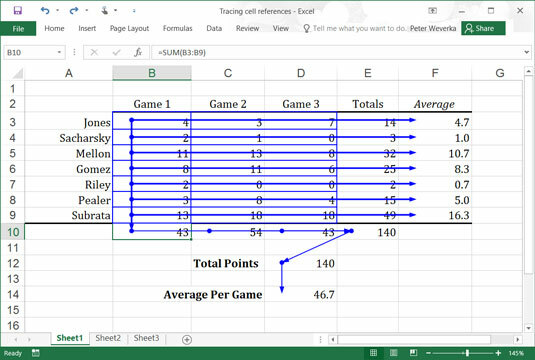 Excel 2016 offers several ways to correct errors in formulas. You can correct them one at a time, run the error checker, and trace cell references, as explained here. By the way, if you want to see formulas in cells instead of formula results, go to the Formulas tab and click the Show Formulas button or press Ctrl+’ (apostrophe). Sometimes seeing formulas this way helps to detect formula errors. When Excel detects what it thinks is a formula that has been entered incorrectly, a small green triangle appears in the upper-left corner of the cell where you entered the formula. And if the error is especially egregious, an error message, a cryptic three- or four-letter display preceded by a pound sign (#), appears in the cell. The table explains common error messages. a placeholder to signal the fact that data isn’t entered yet. #NULL The formula refers to a cell range that Excel can’t understand. Make sure that the range is entered correctly. #NUM An argument you use in your formula is invalid. function uses the right argument and is spelled correctly. To find out more about a formula error and perhaps correct it, select the cell with the green triangle and click the Error button. This small button appears beside a cell with a formula error after you click the cell, as shown here. 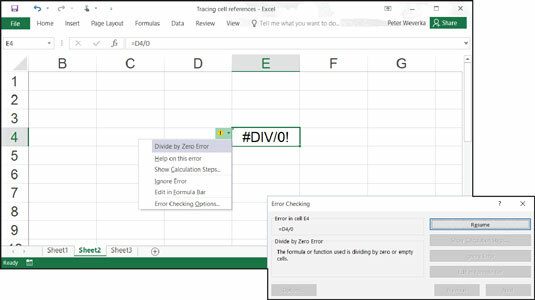 The drop-down list on the Error button offers opportunities for correcting formula errors and finding out more about them. Ways to detect and correct errors. Another way to tackle formula errors is to run the error checker. When the checker encounters what it thinks is an error, the Error Checking dialog box tells you what the error is, as shown. To run the error checker, go to the Formulas tab and click the Error Checking button (you may have to click the Formula Auditing button first, depending on the size of your screen). If you see clearly what the error is, click the Edit in Formula Bar button, repair the error in the Formula bar, and click the Resume button in the dialog box (you find this button at the top of the dialog box). If the error isn’t one that really needs correcting, either click the Ignore Error button or click the Next button to send the error checker in search of the next error in your worksheet. In a complex worksheet in which formulas are piled on top of one another and the results of some formulas are computed into other formulas, it helps to be able to trace cell references. By tracing cell references, you can see how the data in a cell figures into a formula in another cell; or, if the cell contains a formula, you can see which cells the formula gathers data from to make its computation. You can get a better idea of how your worksheet is constructed, and in so doing, find structural errors more easily. Tracing precedents: Select a cell with a formula in it and trace the formula’s precedents to find out which cells are computed to produce the results of the formula. Trace precedents when you want to find out where a formula gets its computation data. Cell tracer arrows point from the referenced cells to the cell with the formula results in it. To trace precedents, go to the Formulas tab and click the Trace Precedents button (you may have to click the Formula Auditing button first, depending on the size of your screen). Tracing dependents: Select a cell and trace its dependents to find out which cells contain formulas that use data from the cell you selected. Cell tracer arrows point from the cell you selected to cells with formula results in them. Trace dependents when you want to find out how the data in a cell contributes to formulas elsewhere in the worksheet. The cell you select can contain a constant value or a formula in its own right (and contribute its results to another formula). To trace dependents, go to the Formulas tab and click the Trace Dependents button (you may have to click the Formula Auditing button first, depending on the size of your screen). Tracing the relationships between cells. To remove the cell tracer arrows from a worksheet, go to the Formulas tab and click the Remove Arrows button. You can open the drop-down list on this button and choose Remove Precedent Arrows or Remove Dependent Arrows to remove only cell-precedent or cell-dependent tracer arrows.